Over the past decade, cinema chains worldwide have diversified their product and experiences in order to attract new audiences. One of the pillars of this strategy has been the expansion of the Event Cinema business which brings non-traditional product to big screens. The portfolio of what constitutes Event Cinema is broad, including concerts and sporting events, live arts performances such as opera, ballet and theatre and even on-screen gaming tournaments. By empowering cinema chains to become less reliant on Hollywood product, this new content has enabled screen-time to be optimised in traditionally slower days or periods, and has helped to bring out new or absentee audiences who may not have visited the cinema for many years. This all sounds rosy, doesn’t it? But Event Cinema doesn't come without its challenges. Without Hollywood-scale marketing budgets to back such releases, cinema operators now often take on the role of distributor and promoter. - not an easy task considering the hunt for niche audiences can be a challenging one. Creating an effective Event Cinema marketing strategy comes down to two key things: finding communities and fostering community. In the Movio Cinema case study 'Nordisk Film Kino’s Marketing Hits a High Note' we examined what I believe is a fantastic approach to finding communities. Nordisk had faced a challenge in marketing the upcoming Event Cinema release of a Kanye West concert recorded at Madison Square Garden in New York. With little-to-no budget, and even less turnaround time, Nordisk turned to their customer database. They discovered they had a small segment of their database that had watched the film ‘Straight Outta Compton’ which fitted a similar urban genre. While the target audience was small, 822 people to be exact, the results from targeting this community were impressive. Nordisk nearly sold out all seats within hours of reaching these customers with a targeted email, and consequently had to add a second screen for the event. Less is more - Nordisk did not go out to thousands of customers to promote the event, but ensured they only reached out to a highly-targeted segment with highly-relevant messaging. Look for niche audiences - It proved that there are, indeed, theatrical audiences who are interested in event cinema, provided they learn about events that are well-suited to their interests. These communities of customers don’t just exist outside of the cinema; they are amongst your average moviegoers. Targeted messaging works - Nordisk have shown that you don’t need to spend a fortune on mass marketing for niche events. The cost of traditional marketing far outweighs the cost of a fine-tuned email or SMS message. 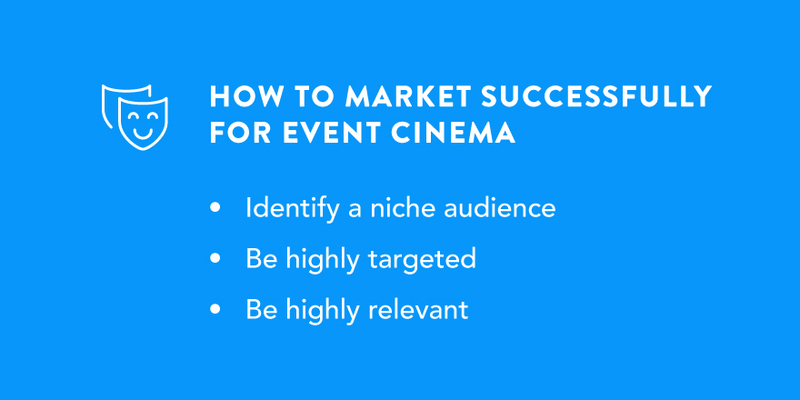 Starting with your existing customer database and finding niche communities within it, is a solid basis for an effective Event Cinema marketing strategy. But what about the new audiences cinemas are hoping to grow through Event Cinema screenings? How do you effectively reach those consumers who may not have been to the cinema in a long time, nor are part of your customer database? Grassroots marketing is a fairly traditional marketing tactic which essentially means local outreach. From my experience in the cinema industry, grassroots marketing for cinema chains could include partnering with local community groups or associations, sponsorship local events, and strategic placement of marketing materials including flyers, posters, brochures or banners in well-targeted locations throughout a community. This approach has been important for the growth of Event Cinema in our industry, as it’s allowed cinema marketers to reach beyond their four-walls of existing cinema customer base to reach new audiences that may be well-suited to an upcoming event. However, the time and effort involved in trying to expand beyond regular theatrical audiences and to reach opera, gaming, music and sports fans in their own communities can be daunting and resource-intensive. Digital marketing tools and, in particular, database marketing, can help to evolve this strategy. But how can database marketing be effective if you are trying to reach beyond your current customer base? 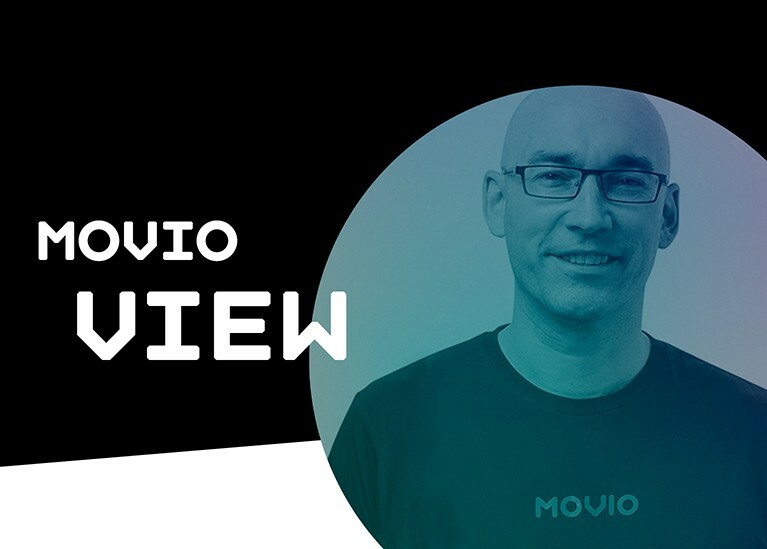 The answer can be found in Movio Cinema’s ability to send highly-targeted campaigns to customers in both your loyalty programme database and to any external customer list you maybe able to build or source. These are what we refer to as ‘list campaigns’. Provided you are abiding by your territories data privacy policies, using list campaigns to augment campaigns with your loyalty programme customers are a fantastic way to directly target your message regarding upcoming events. These campaigns can still be segmented, targeted and personalised, whilst also being managed centrally in your Movio Cinema console. Over time, a digital grassroots marketing approach can help enable you to foster new communities of customers. You may be able to identify sub-segments within your mass customer base that might only attend Event Cinema productions. You could carve out a separate communication strategy based on niche interests, such as rock music productions, ballet or live sporting events. Your cinema brand has the opportunity to be the tie that binds these customers together, unifying interests and creating community through your Event Cinema strategy. A great example of a cinema chain that has done this well is Picturehouse Cinemas in the UK. By creating a community of 'Screen Arts' fans, they now have a separate database of customers who are unified by their passion for arts content. Targeting these fans regularly, and in a highly relevant way has proven to be an effective strategy for Picturehouse, improving email engagement rates and ultimately driving a better ROI. The benefits of a well-constructed Event Cinema marketing strategy are too big to ignore. By using customer data as the underpinning for your strategy, I believe that positive results will be achieved even more quickly.